It was my fourth Munich High End show now, again a bit bigger than last year. Also this year Thursday was not open to all visitors any more, only to trade and press folks. Different from previous years, I present the show the same way as I walked around. Then, there will be no ranking, just my impressions. 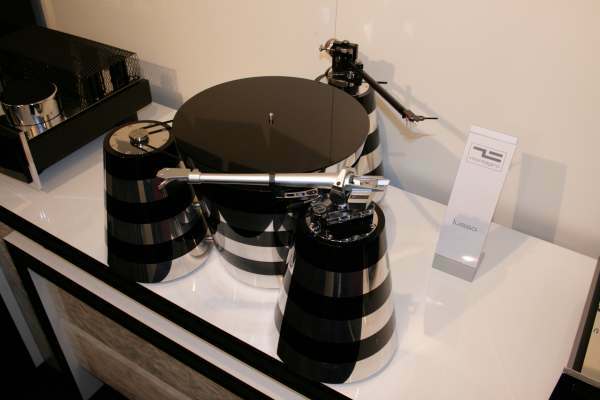 Naim presented their new reference phono stage, the so-called Superline (their standard phono is called Stageline, BTW). 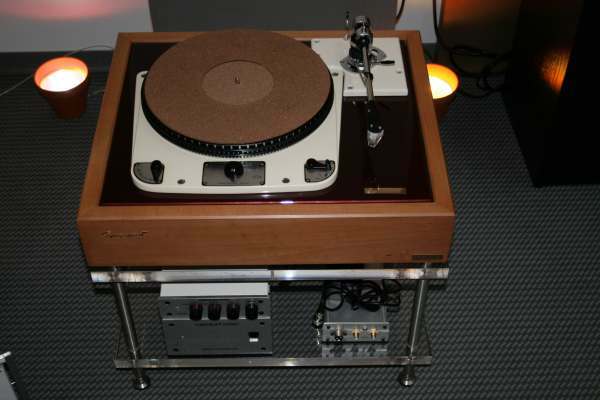 They had a DPS No.3 with Naim ARO and Lyra Skala as front-end, and the deck was equipped with a lift that Willi Bauer designed for the ARO. 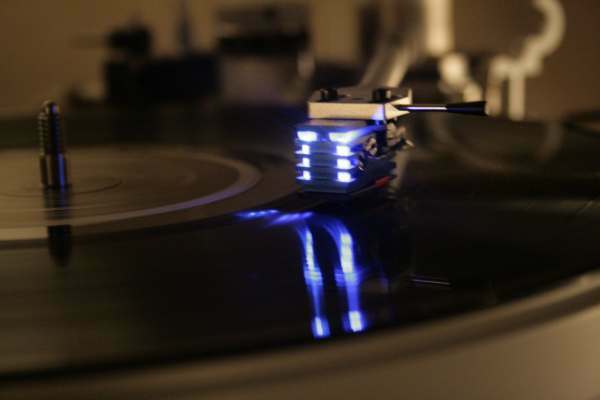 Thankfully, they allowd me to hear my own records. 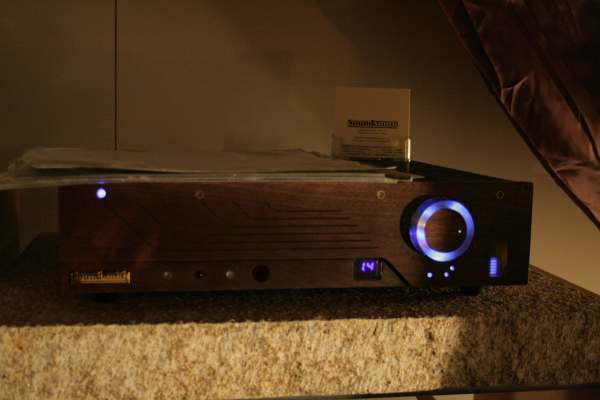 Honestly, this is the best Naim setup I have ever heard. Much improved flow sensation, excellent fine detail. Pitifully, the nice folks from Loricraft did not have their own show room, but were rather presented by Thomas Fast from Fastaudio. 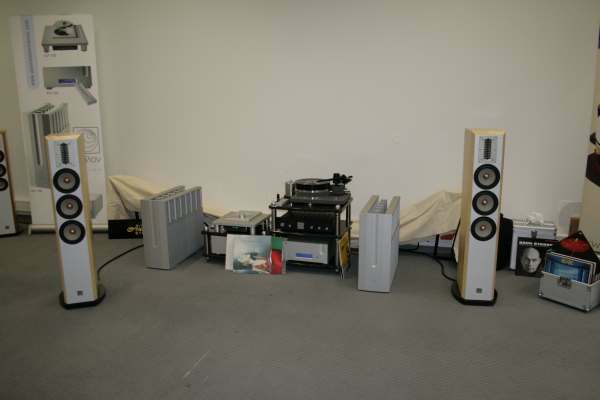 Electronics were either Thorsten Loesch's Abbingdon Music Research or Jonathan Carr's exquisite Connoisseur stages. 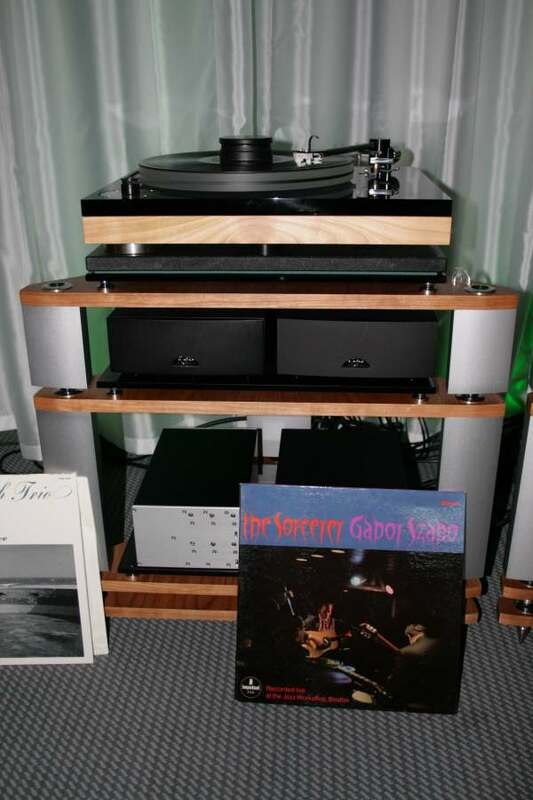 Christian Feickert now is a new member of the vinyl global players. He is not unknown, as he was many years associated with Thomas Scheu. 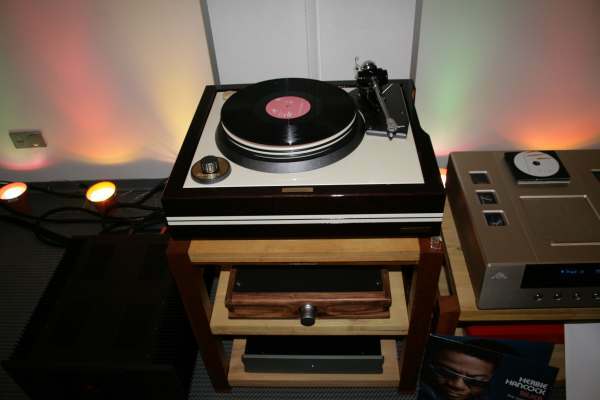 He introduced his own turntable last year, and followed up a more compact deck. Stay tuned for his "Adjust+" software and test record combo, useful for definite Azymuth calibration, soon to be tested by Werner Ogiers at www.tnt-audio.com. 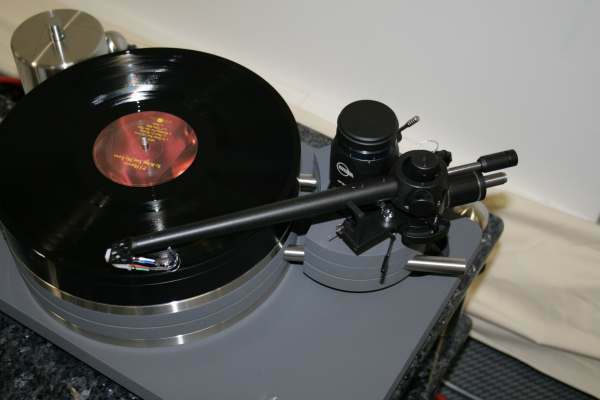 Chris Feickert also presented the new Kuzma 4-point tonearm to the public, still in prototype version. 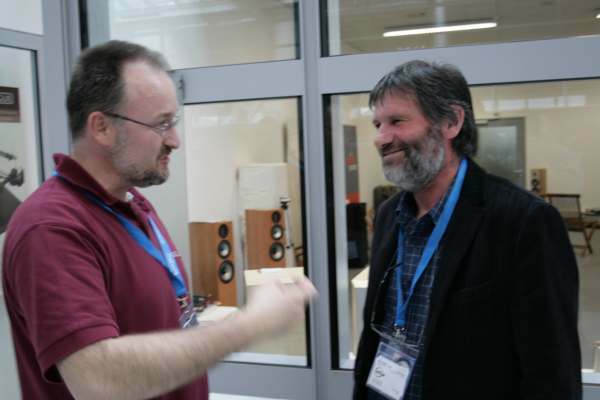 Here you can see Mr.Feickert (left) discussing with Franc Kuzma (right). 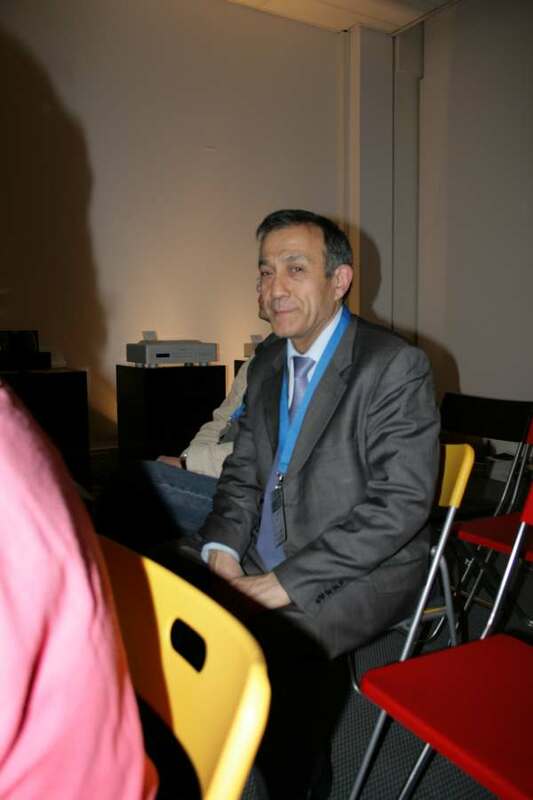 Jean Hiraga is back, world famous Japanese-French audiophile, he who launched the French underground magazine "L'Audiophile", and was raved for the Lectron JH-50 tube amplifier and other realisations. 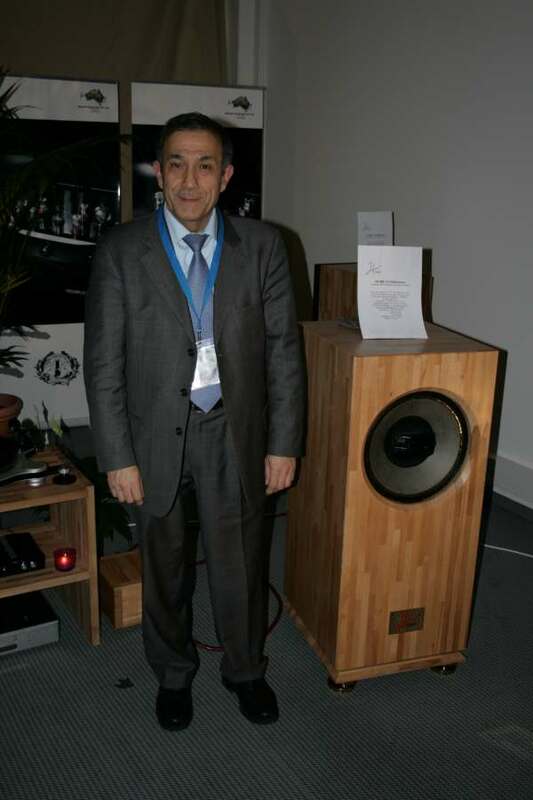 Mr.Hiraga presented his new homage to the Altec coaxial loudspeaker to the public. World premiere. 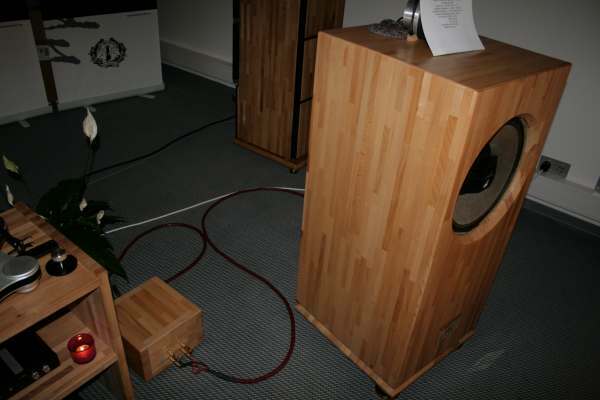 On the first show day, when the speaker was playing without super tweeter added at 15kHz, and without help of a subwoofer, the sound was gorgeous. On the other days, the sound sometimes was not that coherent and seamless, when the helpers were used to shout over the noise from right and left neighbour rooms. Montegiro is a new German brand, which had its startup at the 2008 HighEnd show. 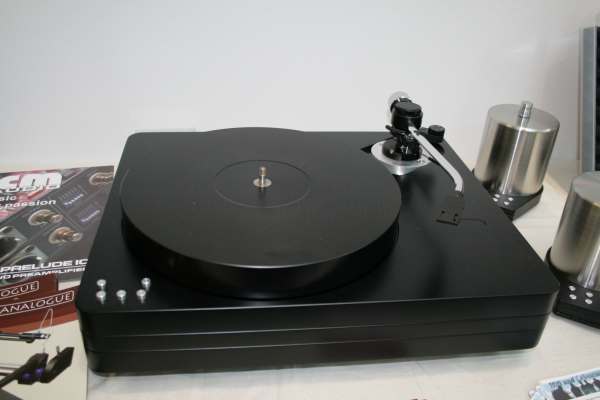 They started with a range of four beautifully designed turntable, though quite expensive. 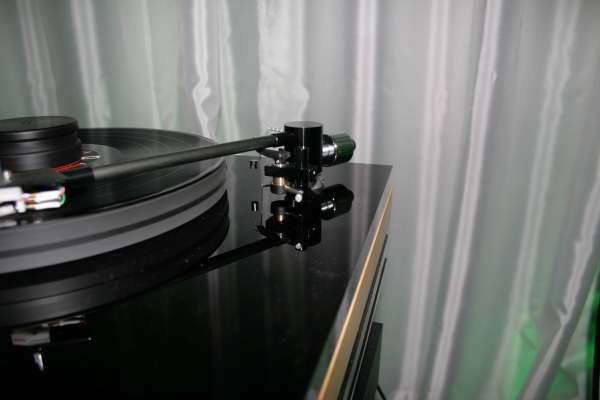 Their top model, Lusso, costs more than 20000 EUR, w/o any tonearm. 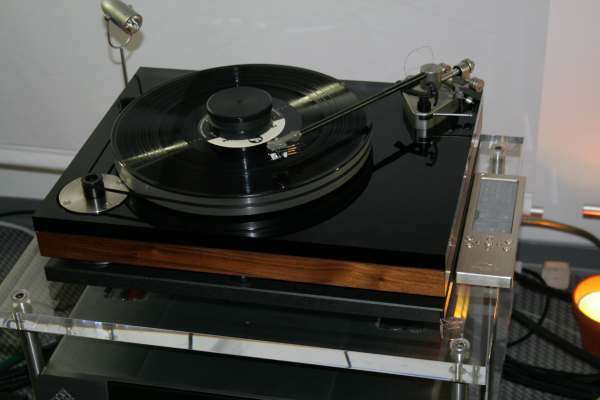 Peter Ledermann and his Soundsmith company is well-known for cartridge repairs in USA. This year they introduced their top-of-the-line Strain Gauge cartridge to the European market. 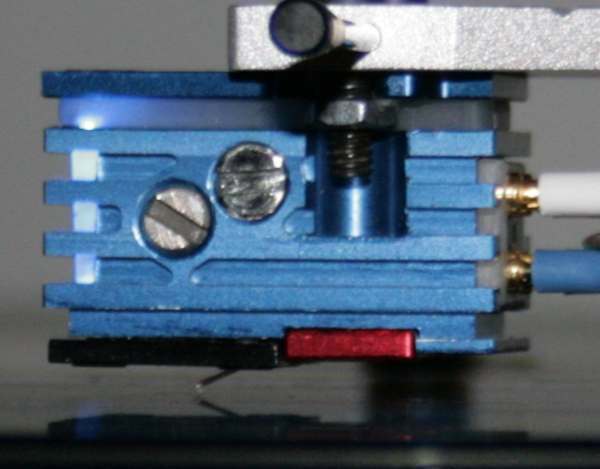 This cartridge is an alternative to the top models from Lyra or Zyx. 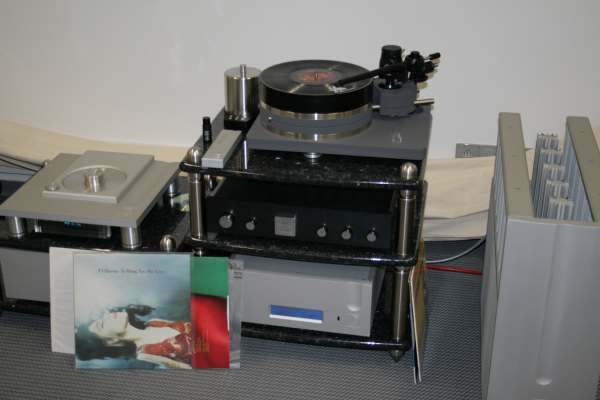 Although the cartridge was mounted only on a small VPI player, I was impressed by the ease and power delivered from my records. The Strain Gauge cartridge needs a special controller, which can directly be plugged into a preamp. Prices depend on the type of controller (basic, or with remote control, or with linestage, etc.) and range from 7500 to 15000 USD. Though, replacement styli are only a few hundreds, so it might be cheap on the long run, compared to buying a new Lyra or Zyx every 2 years.